The article below makes reference to Chelsea Manning passing through Ireland’s Shannon airport en route to Iraq. We now know from direct communication with Chelsea that this was not the case and that she did not pass through Shannon airport at any time, although nearly 2.5 million other US soldiers have done so. The use of Shannon by the US military is an ongoing and contentious issue in Ireland. The information apparently came from a member of Manning’s Unit and was passed onto us in good faith by a trusted source. We apologise for this error and any confusion it has caused. Chelsea Manning’s 27th birthday, the fifth she has spent in prison for telling the truth, was marked in a number of cities around the world including Dublin and London. See these reports from Noise Demo at the US Embassy and Vigil on the Steps of St. Martin-in-the-Fields, London. See also this report on the Vigil by Afri, an Irish organisation working for global justice and peace. Afri has been instrumental in building a base of solidarity for Chelsea Manning in Ireland and has been involved in organising and supporting visits by family members to Dublin (see Manning Family Fund for reports) as well as the Manning Truthfest in Pembrokeshire. 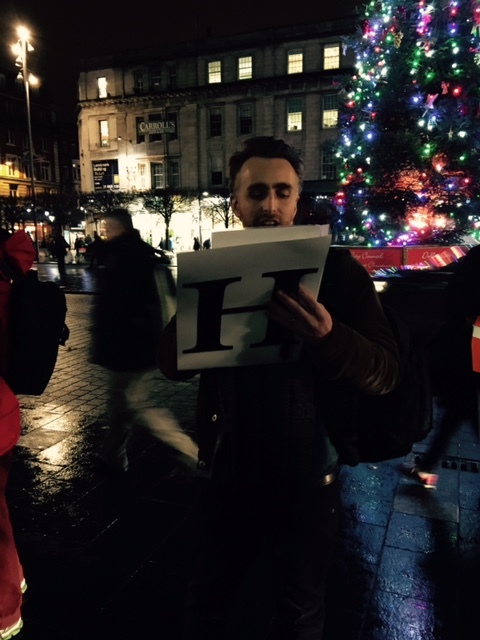 In January this year, a group of Irish artists and musicians led by actor and playwright Donal O’Kelly travelled to Wales to organise this successful solidarity event, something they hope to repeat in the future. 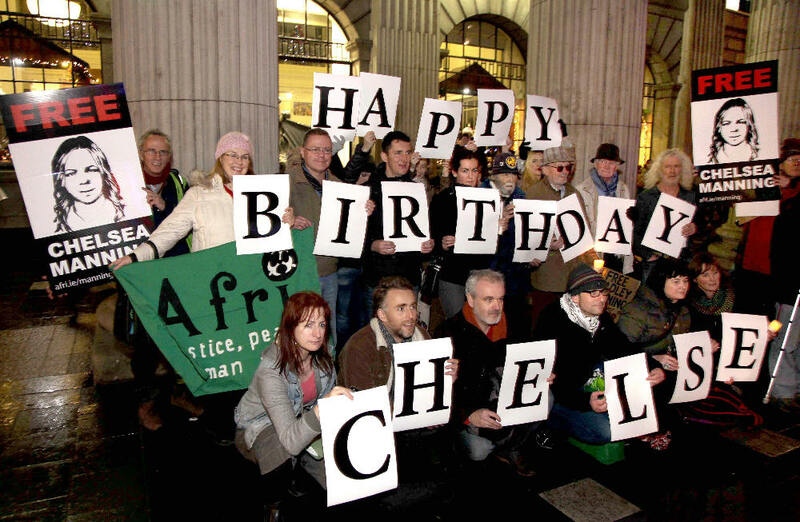 A group of over 30 people – many of whom had met members of Chelsea Manning’s family during their Dublin visits or at the Truthfest – gathered together at the GPO in Dublin at 6pm on 17 December to mark Chelsea’s birthday. 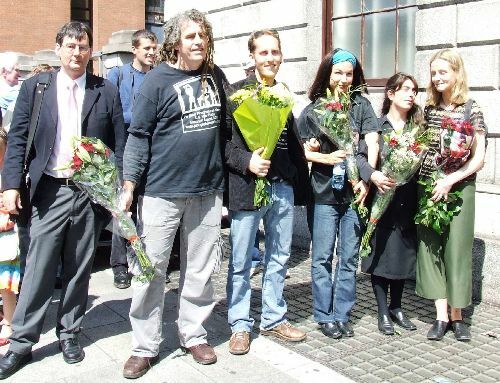 Organised by Ruairí McKiernan and Afri, the vigil was supported by grassroots anti-war activists, groups such as Amnesty International Ireland and numerous TDs including Mick Wallace, Clare Daly, Joan Collins, Maureen O’Sullivan, Joan Collins and Senator David Norris, some of whom had heard members of Chelsea’s family speak about her plight during a meeting with TDs and Senators held at the Dáil last year. Chelsea Manning was sentenced to 35 years in prison in 2013 for leaking hundreds of thousands of documents into the public domain via WikiLeaks, exposing the true nature of the wars being waged in the Middle East and providing evidence of US war crimes. Calls for Manning’s release have been ongoing since her arrest in 2010. I wanted the American public to know that not everyone in Iraq and Afghanistan were targets that needed to be neutralized, but rather people who were struggling to live. At one point in the video there is an individual on the ground attempting to crawl to safety. The individual is seriously wounded. Instead of calling for medical attention to the location, one of the aerial weapons team crew members verbally asks for the wounded person to pick up a weapon so that he can have a reason to engage. For me, this seems similar to a child torturing ants with a magnifying glass. Every now and then you do come across a significant choice. Do you really want to find yourself asking whether you could have done more, 10-20 years later? These are the kinds of questions I didn’t want to haunt me. Chelsea has become an extraordinary symbol of courage and conscience. Chelsea has paid an appalling price for exercising conscience and for standing up for truth, justice and human rights. That’s why Amnesty members across the world are mobilising to demand her release. The Manning family hailed from Rathmines in Dublin (maternal grandfather and great-grandparents) and from Anascaul, county Kerry (paternal great-grandparents). Chelsea’s only time on Irish soil was as one of the two million U.S troops who have visited Shannon airport on a refuelling stop en route to the war in Iraq. Chelsea has shone a light on war crimes and we want to honour her for that. We also want to continue to highlight the ongoing military use of Shannon airport. This is particularly important given the new revelations that Ireland has facilitated illegal CIA torture flights. Two of the TDs who attended Wednesday’s vigil – Mick Wallace and Clare Daly – were arrested at Shannon Airport back in July after attempting to inspect two US military aircraft on the runway to establish whether they were involved in military operations, carrying arms or engaged in other activity that contravenes the Irish Government’s stated policy of neutrality. At a court hearing in December, the case against Wallace and Daly was adjourned to 21 January when the TDs intend to contest the charges against them. There is an ongoing and longstanding campaign against the use of the civilian airport at Shannon for US military purposes and the more evidence that comes out about CIA torture and rendition flights, the worse it looks in terms of Irish complicity and facilitation. Earlier this month, the Minister for Foreign Affairs Charlie Flanagan was forced to apologise and admit that his answers to four previous questions tabled in the House by Clare Daly, in which he had denied the presence of a military aircraft at Shannon in October, had been wrong and that the aircraft was at Shannon as claimed. A number of the US diplomatic cables released by Manning and published by WikiLeaks refer to the use of Shannon by US military as this article by Harry Browne explains. From the cables, we learn that in the wake of the Pitstop Ploughshares acquittals, the Irish government was publicly supporting the independence of the judicial system while later privately telling the US it was prepared to change the law to prevent future acquittals for similar actions. 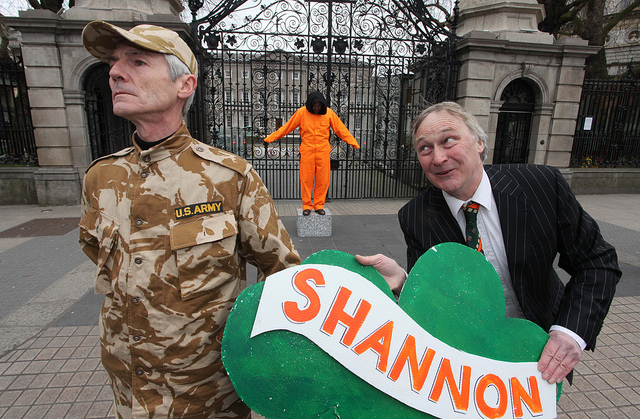 In the 2003 Pitstop Ploughshares action, five anti-war activists from Dublin Catholic Worker, including Manning supporter Ciaron O’Reilly, caused $2.5 million damage to a US Navy plane at Shannon Airport just before the start of the Iraq war. Other of the cables show Irish officials bending over backwards to assist the US in its military use of Shannon and even seeking advice on legal arguments as to why they should not subject US military planes to police inspection as they pass through Shannon; these arguments might be coming under public scrutiny soon in the forthcoming court case against TDs Wallace and Daly which is all about the need for inspections. Thanks to Chelsea Manning, we know that Irish politicians were turning a blind eye to the possibility that Shannon was being used for rendition flights. Although privately worried they might be caught lying if evidence of rendition flights was uncovered, they were paying more attention to how they could manage the PR situation than ensuring that they didn’t need to. among the most tangible benefits of traditionally strong U.S.-Irish relations. Embassy will diplomatically pursue the most workable arrangements possible with Irish officials, but we would appreciate Washington’s judgment as to whether the process of notification of almost everything of a military nature (including by contract carriers) through Shannon is becoming too difficult to make the airport a preferred transit stop. So the Pitstop Ploughshares action very nearly put a stop to the military use of Shannon once and for all. Without Manning’s disclosures, we might never have known any of this, and having the information in the public domain makes it harder for the wool to be pulled over the eyes of the public next time round, as we are now seeing. 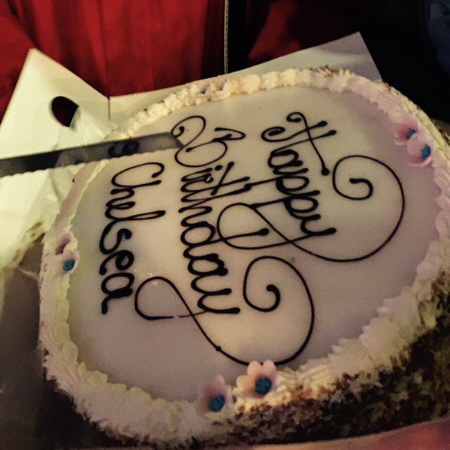 At the vigil, a special birthday cake was cut for Chelsea to mark her 27th birthday, her fifth spent in prison. Ruairí McKiernan, whose birthday is also 17 December, read out a wonderful poem written for the occasion by Sarah Clancy in Galway. to explore my own identity. as nuts and bolt collateral. lets hope that for your next one you’ll be free. And P.S Edward Snowden, keep on running! Photos in this report are by Derek Speirs and Colm O’Gorman. Video by Dave Donnellan. 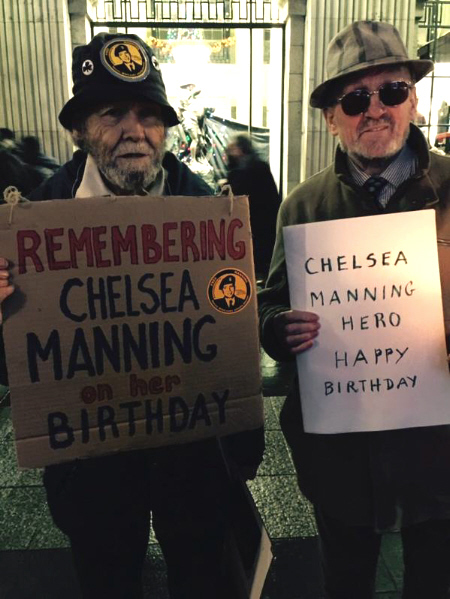 Gallery | This entry was posted in Manning, Reports, WikiLeaks and tagged Afri, birthday, Chelsea Manning, Dublin, Ireland, solidarity, vigil, WikiLeaks. Bookmark the permalink.